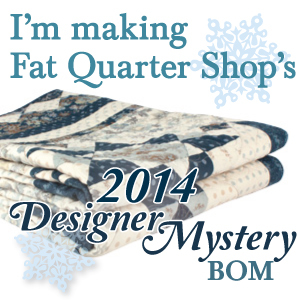 Hmmm … do paperwork or quilt? I took a semi-impromptu vacation day today. My plan was to work on some needed claim paperwork and tax return items. I started off by working in the early morning for my job (remotely), then getting the kids off to school, then going into the office to get some other tasks done that were ‘important’, then met up with Stewart for lunch and then … before you know it – it’s 2:30 in the afternoon! Well, that wasn’t a great start to my plan for today. So – did I buckle down and get into my files and folders? Perhaps start a recycle and shred box and clear a space off the desk? …. Look at what I just opened up! My FQ bundle of Happy Go Lucky! She was definitely into the bright fabrics and she chose Happy Go Lucky! Yeah! I get to make my first project with this fabric now. I already knew the pattern I wanted to use … SWOON. 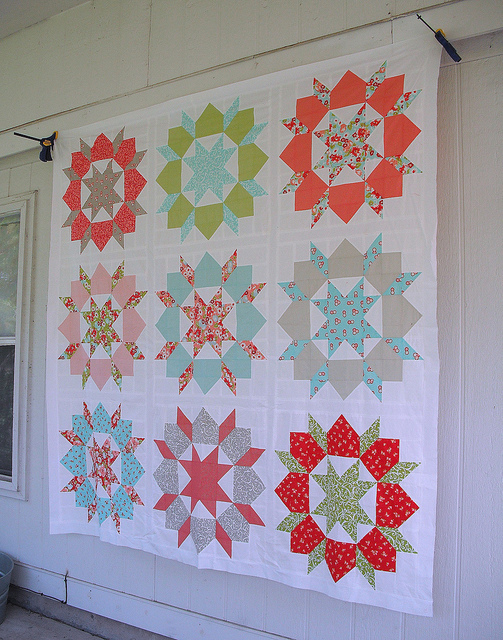 I took this picture randomly from an internet search for Swoon quilt images. Everyone else has already made this quilt (some even more than once), but I haven’t completed my destiny yet. And I had already bought the pattern, right? Right? RIGHT? Crap. I can’t find it. I know it’s here. I also know I can plunk down $10 again to get a PDF sent to me which I can print in black and white on my little home printer. But I already OWN it. Crap. Wait! I know! 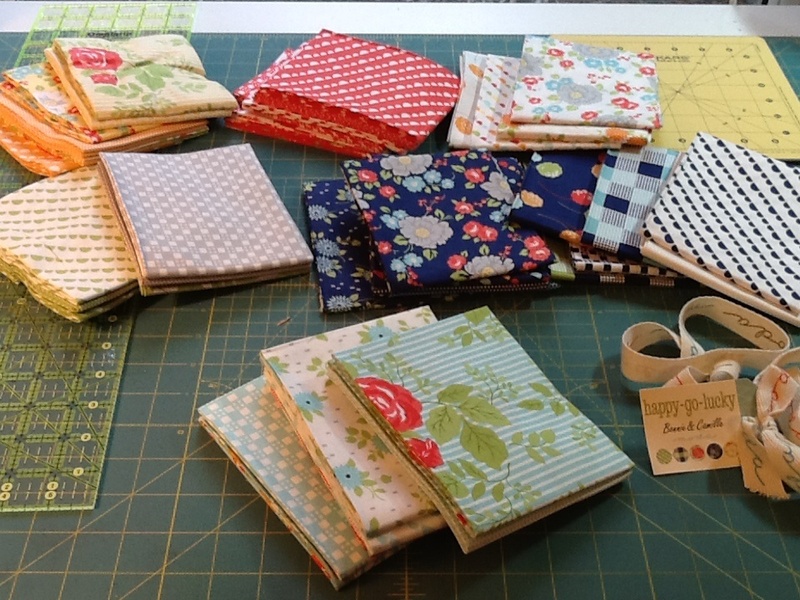 I had bought the CRAFTSY class “Pre-Cut Piecing Made Simple” by Camille Roskelley (author of the Swoon pattern). 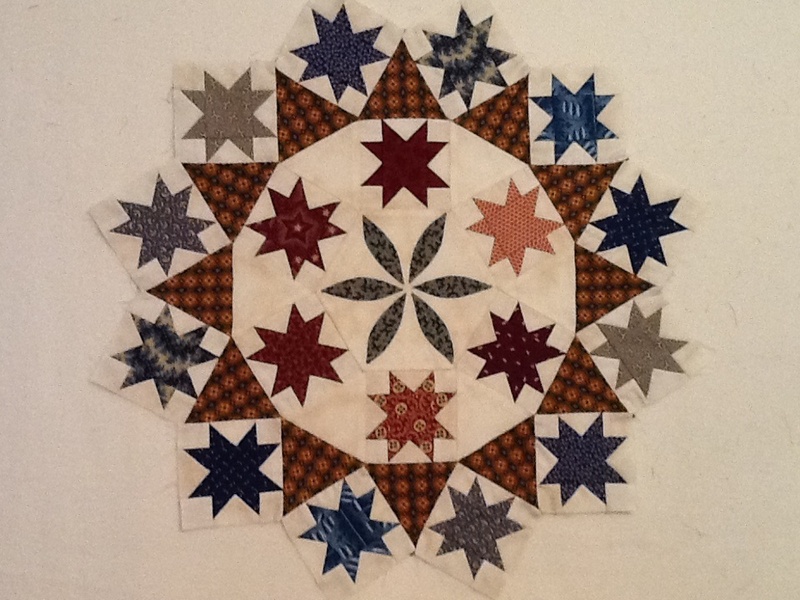 One of the projects in that online class is the Swoon quilt, so I was able to just go online and download the instructions from there! I had only made it half way through the class, so I had not gotten that far already. Meant to be. Meant to be. Hopefully I can get it cut and pieced in a week or two, so I can have it quilted and present it to her at a little gathering she is having on June 1st. I shall try my best. Stay tuned. Oh – one last picture of my completed Robin’s Nest Block 1. This one is all connected now and ready for the next stage. I think, for the most part, the star tips came out great. Maybe a couple are cut off, but I’m happy overall. Swoon is perfect for every occasion! I was thinking about taking that on line Craftsy class. I am in the middle of my Swoon… it’s so fun… you made a good choice, push that paperwork aside!